Without shadow of a doubt, the highlight of my primary schooling years was Friday afternoon inter-school sport, particularly footy come the winter months. It was a pure joy to make it past the spelling test and the Speedy Gonzalis maths ‘race’ a Friday morning would offer up, and then jump on a bus or wait the arrival of our opponents from various parts of Blackburn and it’s surrounds. I liked wearing my shorts underneath my trackies so I could be changed and ready as soon as possible, ready for action. Of course we’d hand the teacher our oranges the morning of a home game, and they’d magically reappear, quartered, at half time of our match. The year 1991 was a big year for my football career. In fact, it was clearly the peak. Not only did I play my first and only game for Richmond, (Little League) but I was one of 3 grade 4 kids who got to play with the 5’s and 6’s. Remember, this was primary school. The grade 6 footballers were like Dermie or Timmy Watson to us in lowly grade 4. To be truthful, I remember very little of the footy played that year, other than the fact we made the grand final, and pipped arch-rivals Blackburn Lake (dirty bastards!!) in the grand final at the stately Kingwsood College. Premiership success! And played on my 10th birthday no less. 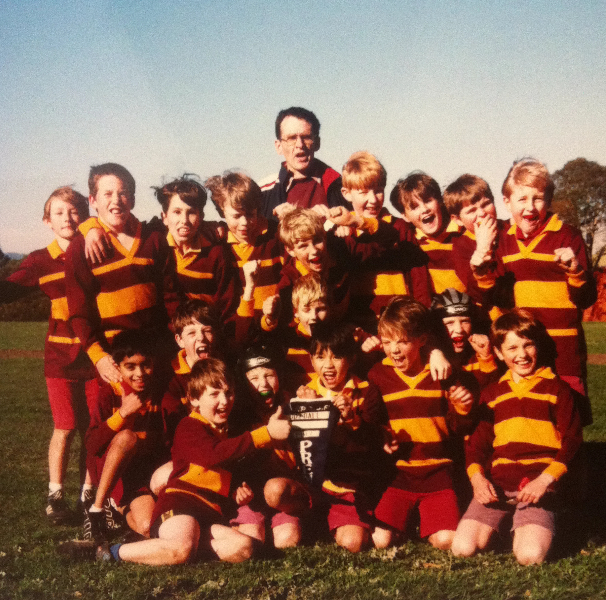 The photo above was taken back at school the following week, and due to being the baby of the team, was plonked front and centre and given the ball to hold. Playing at Kingwsood College was a treat. As you can see in the photo below, they had boundary lines! Not just that, thick, obvious ones. At Blackburn we had to run out witches hats before a match. And look at those padded goal posts! Ours were big hunks of tree wedged into the rock hard and at times gravelly surface. It seemed a fitting grand final venue. The following year, 1992, saw the team struggle, and by the time I was in grade 6, 1993, the basketball phenomenon had depleted our football side. Our coach (coach first, teacher second I think) even tried to prevent the ‘footy players’ from playing basketball, although I can’t remember if he succeeded. We went winless, even scoreless on one occasion against St.Tom’s. The glory years (2 years is a long time when you’re in primary school) seemed a distant memory. Trudging off Morton Park in 1993, I’m 4th from the left. But a new generation came along. 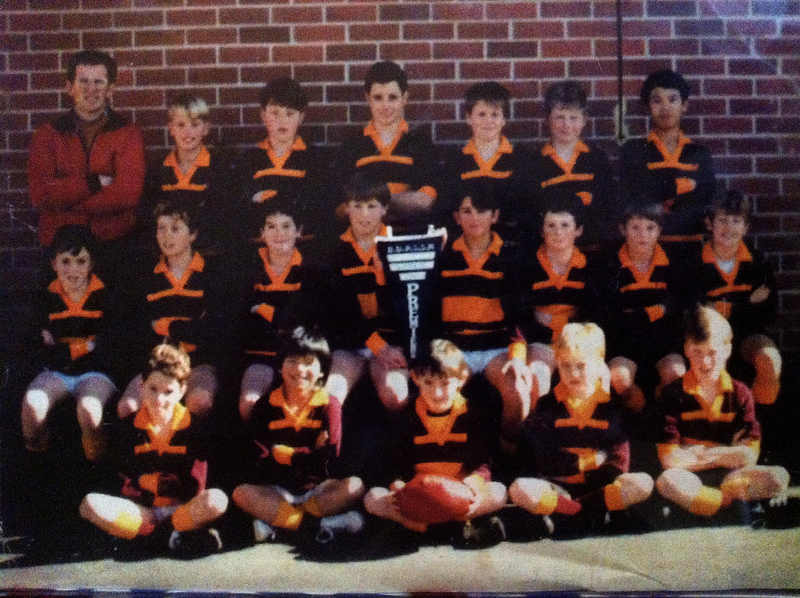 Six years my junior, my brother, Pete, would too taste premiership glory for the maroon and gold in 1998. What’s more, it was also against the dreaded green and red of Blackburn Lake. Kingswood College was again the grand final venue, and though the Lakers had one of those kids who’s matured early, (he looked about 15!) the Burners came out victors in another tight tussle. My brother Pete is the cheeky looking doofus down the front with his thumb up. Note that he’s wearing my Richmond footy shorts (he follows Footscray), which is refreshing as the rest of the team appears to be wearing their school shorts. That never would have happened in my day! Someone also must have had a word to our coach Peter Houghton about the nature of primary school footy, because it became more inclusive when my brother was under his tutelage. This was unfortunate because Pete was switched to full back at half time of one match after kicking 5 goals in the opening half! He’s still bitter, just ask him! Blackburn on the left, Blackburn Lake on the right. 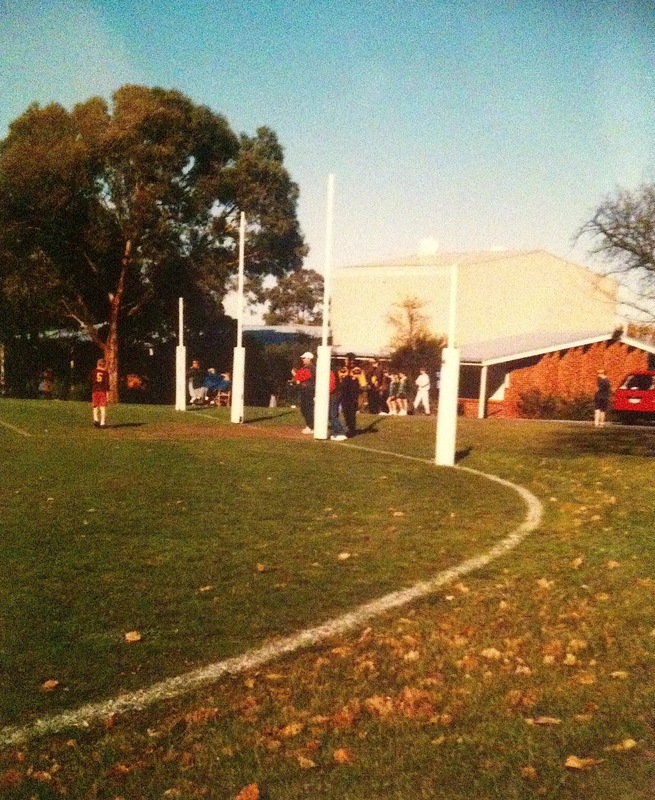 Primary school footy, how I loved you. I’ll leave on this note. How good are these jumpers? No sign of a clash, simple, bold designs. Free of cartoons, images, thunder bolts or ‘experimental’ colours. Refreshing, don’t you think? You can follow my brother Pete on twitter @carr_pete. Ask him about his 5-goal half!! Photos taken by mum and myself. This entry was posted in Musings and tagged afl, Blackburn, Blackburn High School, Blackburn Lake, eastern suburbs, education, Footy, inter-school sport, Kingswood College, Peter Carr, primary school by theholyboot. Bookmark the permalink. I laughed, I remembered, then patted myself on the back (difficult feat!) for keeping the stuff I did. Knew you’d love it some day! By the way, I think you’ll find that Pete’s Grand Final appearance and win was on or very near his 10th birthday too…..
Ah, primary school footy. I mainly remember the lunch-time games at St Pats in Mentone when there seemed to be about three of four games going on at the one time, balls flying everywhere, kids running everywhere.No-one umpiring.